At what point can a book be more than a book? Or a film more than a film? Or a concert more than a concert? Or even an app something more than an app? These might be the questions that filmmarker Davis Guggenheim or educator Geoffrey Canada and/or StudentsFirst founder Michelle Rhee ask on a regular basis given their roles in the award-winning documentary Waiting For Superman. Although the film feels long at times, the greater purpose of the message overshadows the length. It strikes at a failing education system. By the fourth grade, more than half of the elementary students in public schools have fallen behind on required reading skills. And the majority of these students will never catch up. In many cases, their only hope — at least the hope of those followed by Davis Guggenheim — is to avoid neighborhood dropout factories and literally win coveted spots at charter schools that abolish the labels of socio-economic status and drive every student to excel. By every measure, the film strikes at the ugliness of truths — that it is not the communities or the students failing the education system, but rather the education system and "the blob" that controls it is failing the students. Waiting For Superman is as controversial as it is poignant, as it presents the greatest crisis facing this country as reading and math scores have flatlined. It also touches on why these lagging results created a triple jeopardy within the country: a failing education system, a country that has priced itself out of the low-skilled labor market, and the growing unemployment that feeds both socio-economic entitlement programs and an increasingly crowded criminal justice system. "You're doing fine in school until you hit the fourth grade, fifth grade," explains Canada in the film. "Between the fifth grade and the seventh grade, you see a huge number of minority kids go from being B students to D students." Except the problem isn't only related to minorities where it is most severe. For all of the children, they are already developing a sense of their future opportunities — with most concluding that they are going nowhere. In some schools, only one of three high school students will meet the minimum college criteria and about half will drop out all together. Why The Film Sparked Controversy And Criticism. There are more than 2,000 dropout factories in the United States. And the film pinpoints the primary difference between students who succeed and those who do not has nothing to do with the students or their varied and sometimes challenging backgrounds or the funding that the schools receive. It has to do with teachers. Specifically, the film does not target all teachers. It targets poor teachers, many of which are protected by collective bargaining contracts that make it next to impossible to let poorly performing teachers go. Many people mistake the message as union-busting propaganda. But within the context of the story, it becomes clear that it is not exclusively the unions to blame as much as bigger bureaucracy with even the best policies adding even more layers to an already stifled system. The conversation began before the film was politicized. Before the film, most proponents argued for two equally bad choices — paying even more for a system that doesn't work or busting unions that were only created as the result of exploiting teachers decades ago. Both claim they have the best interest of kids at heart. And both are primary drivers for failure. While the film is not flattering for unions, it doesn't drive at either point per se. It recasts the discussion to consider that the only agenda ought to be to educate children. And yet, the current system increases non-teaching administrators and interests while enabling bad teachers, whom Princeton Press says cover only 50 percent of required material. In contrast, good teachers cover 150 percent of the material. For good students and good teachers, it means next year's classes are burdened with students who do not have the foundation for the classes they are in. And it's not necessarily their fault. Waiting For Superman Is A Good Will Pick. Waiting For Superman was chosen because it has become much more than a film. Since its initial release, the producers have created resources for parents to become education activists. In October, there will be a performance by The Speaking Clock Revue, which is multi-artist performance at Wang Center in Boston and Beacon Theater in New York City. All proceeds will benefit The Participant Foundation to support music and arts education programming in public schools. 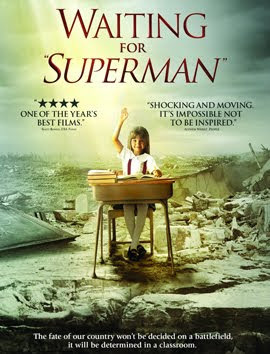 Waiting For Superman is a film you can own or rent on iTunes. You can also find a free Super School app. Waiting for Superman is also on Amazon, where the book Waiting for SUPERMAN: How We Can Save America's Failing Public Schools (Participant Guide Media) is also available. The book and film are also at Barnes & Noble. The book includes a $15 gift card from DonorsChoose.org to give to a classroom in need. The revolutionary concept site matches people who are willing to give with specific classroom needs. The innovative nonprofit helps donors search for specific needs or proximity. Even without the gift card, DonorsChoose empowers people to directly help specific education projects.